The Sony FS700 is a $6000 video camera that can shoot HD up to 960fps or 4K at 60fps. It’s an excellent camera that can shoot some beautiful imagery, especially at 240fps (the 960fps footage really isn’t all that, however). 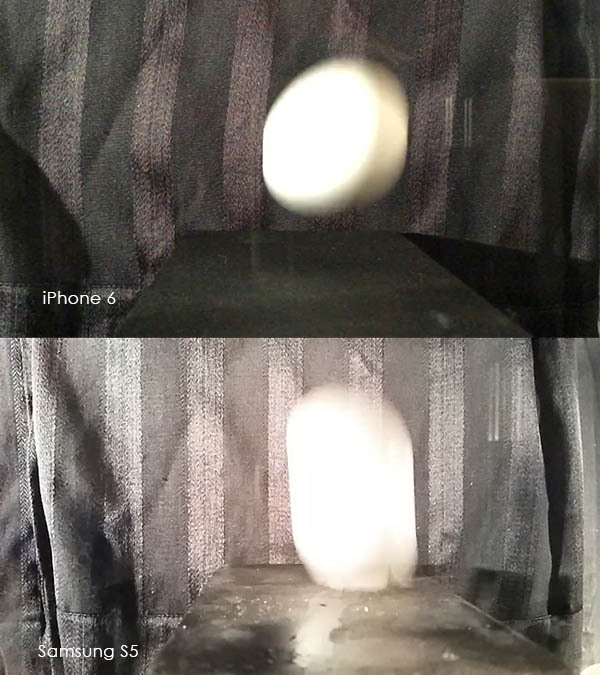 The iPhone 6 is a $700 phone with a video camera that shoots at 240fps. I thought it’d be pretty interesting to compare the iPhone 6 to the Sony FS700. I mean, the iPhone couldn’t possibly compare to a video camera that is dedicated to shooting high speed video, right? Well, ok yes, you’re right. Usually. But surprisingly, the iPhone 6 holds its own in many cases and if you have a low budget production, could be a solution for you. 1: The FS700 shoots 1080p, the iPhone shoots 720p. Obviously if your footage HAS to be 1080p, then the iPhone is a no go. However, there are many instances where 720p is more than adequate. 3: You can’t play the iPhone movies created in slow motion on Windows. The Windows version of QuickTime does not support the feature. They can be converted with a video editing app, but this is a really annoying problem for Windows users trying to shoot with the iPhone. The Sony movies play fine on a Mac or Windows machine. 4: The iPhone will automatically try and focus and adjust brightness. This is the biggest problem with the iPhone. If you’re going to shoot with the iPhone you HAVE to consider this. We’ll discuss it a lot more in this article. 5: The iPhone does let you zoom and record, but it’s not an optical zoom so it’s lower quality than the non-zoomed image. With the FS700 you can change lenses, put on a sweet zoom lens, and zoom in to your hearts content. But that’s one of the things you pay the big bucks for. We did not use the iPhone’s zoom feature for any of these shots, so in some cases the iPhone is a bit wider than the FS700 equivalent. Our first example is a falling egg. The FS700 footage is obviously better in this case. The iPhone does very poorly in low light. You can see this in the amount of noise on the black background. It’s very distracting. Particularly since the egg portion IS well lit. Also, you’ll notice that the highlight on the egg is completely blown out. Unfortunately, there’s nothing you can do about this except light better. One of the problems with the iPhone is the automatic brightness adjustment. It shows up here in the blown out highlight, with no way to adjust the exposure. You get what you get, so you NEED to light perfectly. In the video there’s also an example of the FS700 shooting at 480fps. The 960fps mode of the FS700 is pretty lacking, but the 480fps does produce pretty good footage. For something like the egg, the 480fps has a better look since the breaking of the egg happens so fast. Even the 240fps isn’t fast enough to really capture it. All the footage is flickering as well. This is a bit more obvious with the FS700 because there’s no noise in the background. The 480fps footage has been de-flickered with Flicker Free. Compare it with the 240fps to see the difference. In this case we have a shot of some cars a bit before sunset. This works out much better for the iPhone, but not perfectly. It’s well lit, which seems to be the key for the iPhone. Overall, the iPhone does a decent job, however it has one problem. As the black van passes by, the iPhone auto-adjusts the brightness. You can see the effect this has by looking the ‘iPhone 6’ text in the video. The text doesn’t change color but the asphalt certainly does, making the text look like it’s changing. This does make the van look better, but it changes the exposure of the whole scene. NOT something you want if you’re shooting for professional uses. The FS700 on the other hand, we can fix the aperture and shutter speed. This means we keep a consistent look throughout the video. You would expect this with a pro video camera, so no surprise there. It’s doing what it should be doing. However, if you were to plan for the iPhone’s limitation in advance and not have a massive dark object enter your scene, you would end up with a pretty good slow motion shot. The iPhone is a bit softer than the Sony, but it still looks good! Also note that when the FS700 is shooting at 480fps, it is much softer as well. This has some advantages, for example the wheels don’t have anywhere near as much motion blur as the 240fps footage. The overall shot is noticeably lower quality, with the bushes in the background being much softer than the 240fps footage. Next to the runway at LAX, there’s a small park where you can lay in the grass and watch planes come in about 40 feet above as they’re about to land. If you’ve never seen the underbelly of an A380 up close, it’s pretty awesome. We did not see that when doing this comparison, but we did see some other cool stuff! Most notably we saw the problem with the iPhone’s inability to lock focus. Since the camera has nothing to focus on, when the plane enters the frame it’s completely out of focus. The iPhone 6 can’t resolve it in the few seconds it’s overhead, so the whole scene is blurry. Compare that to the FS700 where we can get focus on one plane and when the next one comes in, we’re in focus and capture a great shot. The iPhone completely failed this test, so the Sony footage is easily the hands down winner. One last example where the iPhone performs adequately. The only problem with this shot is the amount of background noise. As mentioned the iPhone doesn’t do a great job in low light, so there’s a lot of noise on the black background. Because of the flimsy phone tripod, it shakes a lot more as well. However, overall the footage is ok and would probably look much better if we’d used a white background. This footage also has a flicker problem and we used Flicker Free again on the 480fps footage to remove it. You’ll notice the detail of the foot and chalk particles are quite good on the iPhone. Not as good as the FS700, but that’s not really what we’re asking.